Taking its name from Japanese, umami is a pleasant savory taste imparted by glutamate, a type of amino acid, and ribonucleotides, including inosinate and guanylate, which occur naturally in many foods including meat, fish, vegetables and dairy products. As the taste of umami itself is subtle and blends well with other tastes to expand and round out flavors, most people don’t recognize umami when they encounter it, but it plays an important role making food taste delicious. How to write umami in Japanese? うま味 is the correct way of writing in Japanese to deliver the definition of WHAT is UMAMI. There is the other way to pronounce UMAMI, 旨味. This word has broader meaning to express deliciousness. Dr. Kikunae Ikeda, who discovered umami in 1908, named this fifth taste as umami and chose うま味 not but 旨味 to make apart two meanings. Do you have specific umami score of natural ingredients? Please visit our website at Umami-rich Food where you can get glutamate scores of dozens of natural ingredients. Please note the score varies by individual specificity. Where can I buy umami? What is difference between umami and MSG? Though the glutamate in MSG and in umami-rich ingredients is the same, MSG is one of the umami substances that is commercially made using the fermentation method from natural ingredients such as sugar cane. And umami is a savory taste derived from naturally occurring glutamates such as tomatoes, cheese and cured hams. 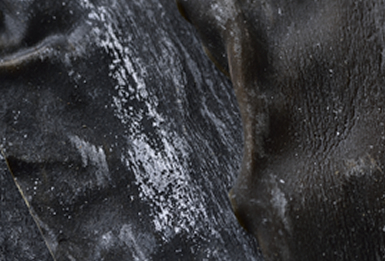 What is that white powder on the surface of kombu? Dried kombu may be covered in a fine white powder. Though occasionally mistaken for glutamate, this powder is in fact a type of mildly sweet sugar known as mannitol, another taste element of kombu. 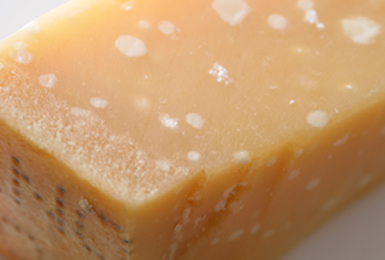 What are the white crystals visible on long-ripened cheesessuch as Parmigiano Reggiano? As cheese ages its amino acid content rises and water content declines. These white crystals are mainly clumps of amino acids not readily soluble in water, such as leucine, isoleucine, and valine. Glutamate is only found in very small amounts inside the white crystals. Is inosinate the umami component in cured ham? 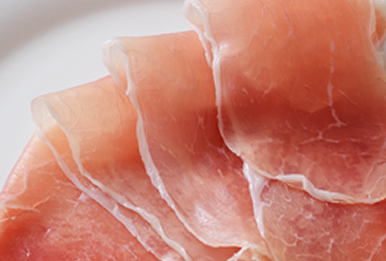 The umami in cured ham is not inosinate, but glutamate. Although, like katsuobushi (dried bonito flakes), ham is an animal product, it contains almost no inosinate. Inosinate is produced when ATP (adenosine triphosphate), the energy source in animal muscles, is broken down posthumously by enzyme action. If this disintegration becomes too advanced, inosinate will turn into another, different substance, from which umami is absent. This means that inosinate content first rises after death, then falls. Raw pork is rich in inosinate, but cured ham is pork that has been salted then aged over a long period of one to two years. During that time the inosinate content declines, reaching almost zero by the time the ham is ready for consumption. Meanwhile, glutamate increases during aging, and is concentrated by the drying process. This compensates for the drop in inosinate and makes cured ham a food with umami to spare. 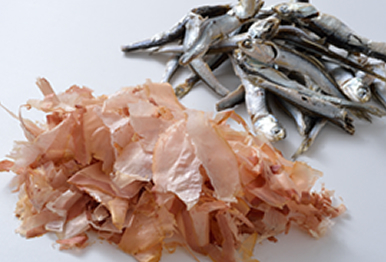 Is the umami component of foods like katsuobushi andniboshi (dried anchovies) inosinate? Inosinate does indeed account for most of the umami in foods such as katsuobushi and niboshi. The process used to manufacture katsuobushi and niboshi differs from the usual processing of dried fish, in that the fish is heated to almost 100℃. This heating deactivates the enzyme that breaks down inosinate into a different non-umami substance, thus preserving the inosinate content. Katsuobushi and niboshi are also rich in glutamate. 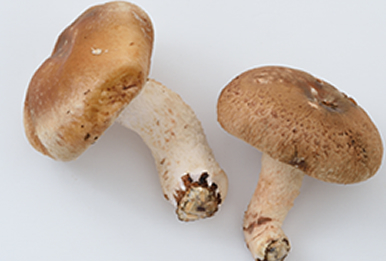 Is guanylate the umami component in fresh mushrooms? Fresh mushrooms contain almost no guanylate. Guanylate is a nucleotide, one of the components of RNA (ribonucleic acid). In fresh mushrooms, a pre-guanylate substance is preserved within the cells. When fresh mushrooms are dried or frozen, for example, the cell wall disintegrates, and enzyme action converts that substance into guanylate. Fresh mushrooms do contain a lot of glutamate. What is the difference between the glutamate in seasonings/condiments and glutamate found in the likes of tomatoes and kombu? The glutamate in foods such as tomatoes and kombu is the same substance as the glutamate in seasonings and condiments. Most foods contain minerals such as sodium, potassium and magnesium. This means that the glutamate in tomatoes and kombu, like the glutamate used as a seasoning, is actually present as a glutamic acid salt such as monosodium glutamate or potassium glutamate. What is the Umami Information Center? Umami was discovered in 1908 by a Japanese scientist Dr. Kikunae Ikeda. In 2008, we celebrated 100th anniversary of its discovery. The Umami Information Center (UIC) was established in 1982 to promote the global spread of information on umami. Following its establishment, in April 2007, in order to safeguard its neutrality and ensure its fairness and openness, the UIC has been accredited by a Tokyo Metropolitan Governor’s office as a Non Profit Organization (NPO). What is the Umami Information Center ‘s mission? The UIC is dedicated to the spread of accurate and beneficial information concerning umami within Japan and throughout the rest of the world. What does the Umami Information Center actually do? We organize symposium and workshop both in Japan and overseas. We create websites in Japanese and English. Umami related leaflets, recipe books and DVDs are published and revised. How can I join umami related events? We make announcements on some of upcoming events. To win this advantage, please subscribe the Umami Information Center e-newsletter. What is the financial source of the Umami Information Center? UIC is financed by membership fee and donation from a food industry. Does the Umami Information Center publish any books? The Umami Information Center publishes several brochures on umami. Please check our publications section at Publications . Can I buy UIC publications? Since we are non profit organization, we don’t sell our publications. For printed samples, please request to www.umamiinfo.com . Members will be provided depend on their membership status and units upon request.